This is the eighth in a series of quick-start Inform 7 tutorials using examples from Colossal Cave Adventure. More information about this tutorial series can be found here: A Quick-Start Guide to Inform 7. There are two significant mazes in the cave. One is the maze of twisty little passages all alike, and one is the maze of twisty little passages all different. This lesson will cover techniques for both of them. 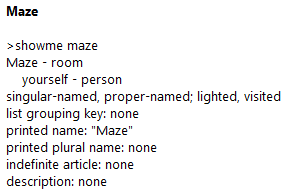 That’s all very well for the first room, but we can’t create multiple rooms named Maze. There’s no way to tell them apart in the source code. And isn’t there some way to avoid pasting “A maze of twisty little passages all alike” over and over? The prior lesson involved creating a kind of room, the cave room, in order to control where the dwarves appeared. We can use a related technique here. When we declare a new kind, we can overwrite any of the properties of the base kind. Using SHOWME, let’s take a look at the properties of a base room. The properties of interest to us are “printed name” and “description”. By changing the default values for these properties, we can create rooms that have identical headers and identical descriptions. After that, we can name the maze rooms whatever we want in the source code – there won’t be any way for players to tell. A maze room is a kind of room. The printed name of a maze room is usually “Maze”. There is a maze room called Maze1. A maze room called Maze2 is east of Maze1. A maze room called Maze3 is north of Maze1. That’s all it takes. Every maze room will display “Maze” as its printed name, and every maze room will display “A twisty maze of passages all alike” as its description. A maze room called Maze4 is south of Maze1. 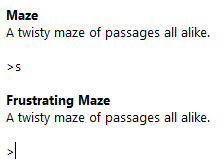 The printed name of Maze4 is “Frustrating Maze”. This would override just the printed name at the top of the room. The description would be the same default as before. Disclaimer: The techniques described here are unusually advanced for this quick-start guide. Tables are extremely useful, but it will be difficult to repurpose this example without reading chapter 16 in the Inform 7 documentation. If you are currently at a game jam, you may wish to skip this section. We could use a similar approach for the maze of twisty little passages all different. The room names are again all the same, with only the descriptions being different. But the source code would be annoying to read. Instead, I’m going to use a table to define the rooms. Tables allow you to define a group of related things very rapidly. They are more typically used for things than rooms, but we’re going to make an exception. Really important: In Inform 7, tables are laid out with tabs. They cannot be laid out with spaces. Copying and pasting the source code below will not work unless you replace the spaces with tabs. A d_maze is a kind of room. The printed name of a d_maze is usually “Maze”. 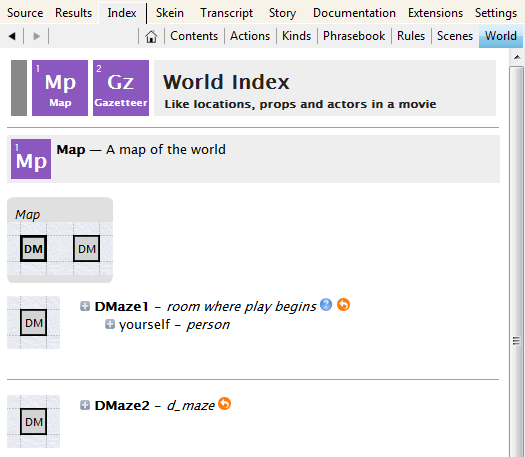 Some d_mazes are defined by the Table of Different Maze Rooms. Add the exits to the table. Hook up the exits in the game. A d_maze has a room called the n_exit. A d_maze has a room called the e_exit. A d_maze has a room called the s_exit. A d_maze has a room called the w_exit. That compiles, but n_exit doesn’t mean anything to the game. What we need is to actually go through and tell Inform “hey, put the n_exit room to the north, put the e_exit room to the east, put the s_exit room to the south”, and so forth. We’re going to do that with a new phrase. A phrase is essentially a subroutine. It sits around outside any other code and waits to be called by the program. now the w_exit entry is mapped west of the d_maze entry. Why include “if there is a n_exit entry”? Otherwise, Inform would attempt to map a blank (the two dashes) in some places. This will cause a runtime error, because a blank is not a room. When the game encounters this code, it will go searching for a phrase that starts “To map the rooms correctly:” and run the code in that phrase. Everything works now, and the table is relatively compact and easy to read. This barely scrapes the surface of tables or activities. Activities are one of the most powerful systems in Inform 7, allowing pieces of code to be reused all over the game. Tables have a more limited utility, but when they are called for, they are extremely useful. Wow! I just worked through this example and it really made sense. I finally understood tables in Inform. Thank you! As I was following these tutorials I kept adding them all to the same project in Inform. I’m having a bit of trouble figuring out how to link the twisty passages from this lesson to the rest of the story. I was going to connect them to another cave room created in a previous lesson. North of Low N/S Passage is DMaze1. Then I tried putting the Low N/S Passage as the s_exit for Dmaze1 in the table. This compiled, but the three DMaze rooms were still off by themselves on the Index>World Map, and going N in Low N/S Passage wasn’t possible. I’ll look in the documentation and Aaron A. Reed’s book for more info. But if someone would like to offer a hint, I’d appreciate it. This is a tricky bit of Inform, and I’m glad you called it out. The problem you’re having is that, when the compiler hits the table, it thinks you’re declaring DMaze1 a second time. DMaze1 is south of Low N/S Passage. *after* the table, and everything should be fine. change the north exit of DMaze1 to Low N/S Passage.